We met Bart Fawbush of Bartholomew Winery at the Washington Grape Grower’s Conference in Kennewick and hit it off immediately. When he shared his vision for a wine that would give back to the amazing brothers and sisters in uniform who put their lives on the line on a daily basis to represent and serve our country and communities we got goosebumps. And then got to work! 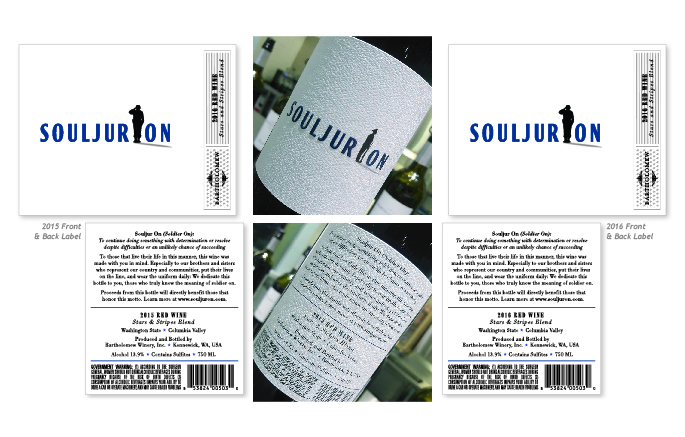 The resulting Souljuron labels are bold, crisp, clean and heavily embossed — and feature a different image in the logo for each year’s Stars and Stripes Blend. The first production year is 2015 so it’s not to late to start your collection now!